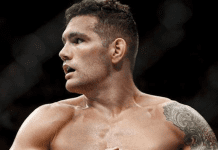 Former UFC middleweight champion Chris Weidman has not fought since his July 2017 defeat of Kelvin Gastelum. 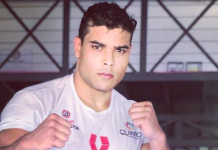 The reason for this prolonged absence is a complicated thumb injury that he sustained during the fight. Unfortunately, Weidman’s thumb is still not healthy. Far from it, in fact. Shortly after his fight with Gastelum, the former champ went under the knife to repair his injured digit. After months of rehab, he’s unfortunately now scheduled for another surgery this coming Monday, as his injured thumb has become arthritic. … and his cartilage wore away. Bone on bone pain. So they will be taking a bone from his hip out and inserting into his thumb. Hoping for a two month recovery and a return in the fall. He can’t squeeze anything with his left hand at the moment without sharp pain. Needless to say, it’s probably going to be awhile before we see Weidman back in the cage. With his win over Gastelum, Chris Weidman rebounded from a trio of tough, stoppage losses: a controversial knee-induced defeat to Gegard Mousasi, a knockout loss to UFC 225 title challenger Yoel Romero, and a TKO defeat at the hands of Luke Rockhold, which marked the end of his title reign. 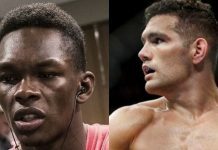 Prior to these losses, Weidman was a perfect 13-0 as a pro—a run that included triumphs over Demian Maia, Mark Munoz, Lyoto Machida, Vitor Belfort, and of course, middleweight Anderson Silva, whose legendary streak he ended with a second-round punch in July of 2013. 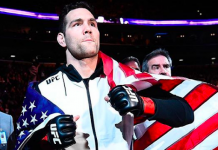 Weidman is currently 13-3 overall, and remains one of the middleweight division’s top players. 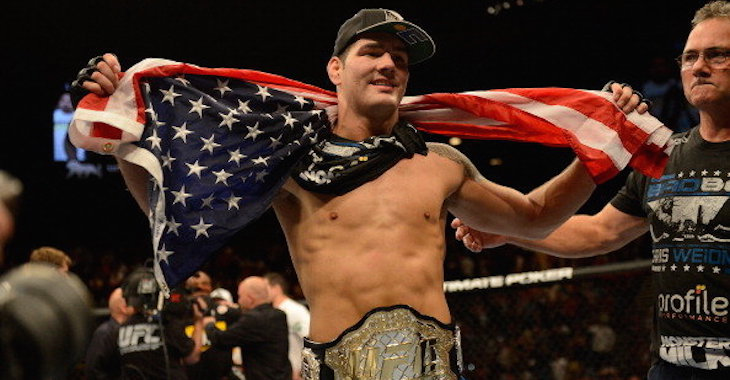 Who do you want to see Chris Weidman fight once he’s healthy enough to return to the cage? Join the conversation in the comments section below this post. This article first appeared on BJPenn.com on 4/4/2018.